To extend ridged HeadFlash a 1-inch portion of the back lip on 1 HeadFlash is removed allowing the 2 pieces to overlap. 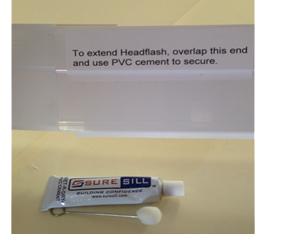 The 2 HeadFlash are than adhered using any high quality PVC to ABS cement. 1. Remove 1-inch segment of the back lip on one HeadFlash. 2. Overlap both pieces of HeadFlash at the point where the back lip was removed. 3. Glue the pans together using PVC to ABS cement.